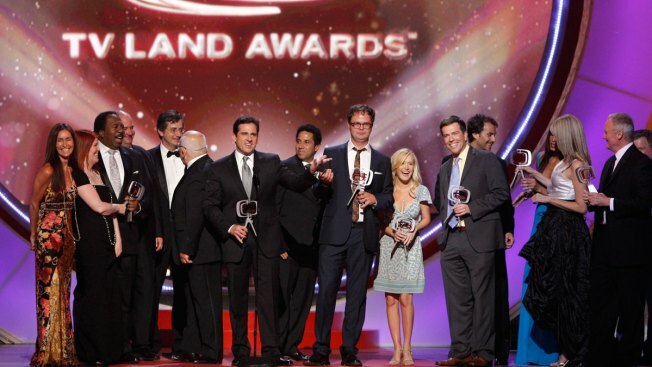 In this file photo, actor Steve Carell, center and the cast of "The Office" accept the future classic award on stage at the TV Land Awards on June 8, 2008 ,in Santa Monica, Calif.
Ready to go back to Dunder Mifflin? NBC is reportedly planning to revive "The Office," according to TVLine. Steve Carell will not be returning as Michael Scott, but the new series would involve a mix of old and new characters, all working at the Scranton, Pennsylvania, branch of everybody's favorite paper company. This plan no doubt comes as a result of the success of "Will & Grace," which recently returned from the dead and came back to NBC after more than 10 years off the air. "The Office" ended in 2013 after eight seasons, with most of the original cast still intact aside from Carell. NBC entertainment chairman Bob Greenblatt has commented on the possibility of the show's return before, telling Deadline in August that the network execs "often talk about 'The Office,'" and that if Greg Daniels, the creator of the U.S. version of the show, were interested, NBC would also be interested. While we don't yet know which original cast members might or might not return (aside from Carell), Mindy Kaling, who was both a writer and an actor on the show, has said that she would most likely be involved if it were to happen. "I loved working on the show and I was there for eight years," Kaling said on "The Talk" back in September. "I think that if Greg Daniels, who did the American version of the show, he's such a genius. And if he were to be in charge of it, I can't imagine that I wouldn't want to help out in some way, or write, and I feel like probably the rest of the cast feels the same." Jenna Fischer, John Krasinski, Rainn Wilson, Ed Helms, Oscar Nunez, Angela Kinsey, B.J. Novack, Leslie David Baker, Brian Baumgartner, Kate Flannery, Phyllis Smith, Craig Robinson, Creed Bratton, Paul Lieberstein, Ellie Kemper, and Zach Woods also starred at various points during the show's run. NBC had no comment on the report.